It's been a busy spring. Mid April we wrapped up construction on the Fredericksburg, Texas skatepark. This project was a long time coming. We worked with the Fredericksburg Morning Rotary Club for over two years designing, planning & fundraising for this park. It was our first project in Texas so we were excited to bring our style of skatepark to the state. 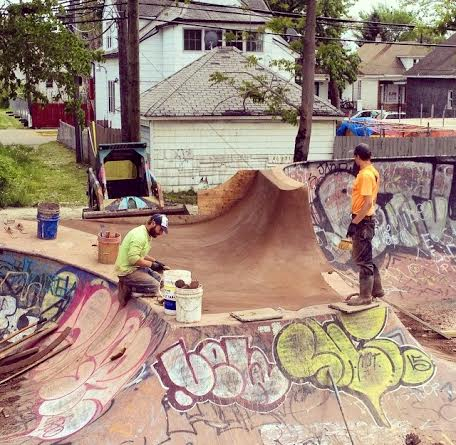 Next up we sent one crew out to Michigan to get started on the Clawson, Michigan Skatepark outside of Detroit. While in Michigan the guys were also able to do some repairs & upgrades at Ride It Sculpture Park. Heard it's already covered in graffiti. Our other crew headed out to Montana to build phase 2 of the Big Sandy, Montana Skatepark. This is another project brought to you by Jeff Ament and Big Sandy is actually his home town. The crew should be completed by next week and in time for the annual Big Sandy Skatepark BBQ on June 27. Last weekend we were able to make a visit to the Thunder Park that we completed on the Blackfeet Reservation last fall in Browning, Montana. It was absolutely amazing to visit the park and see all of the kids out skating, most of them there from morning until night learning to ride and having fun with their friends. It was incredibly rewarding to see the fruits of our labor being enjoyed by so many kids with so few recreational opportunities and to have them express so much appreciation for us building the skatepark for them. The park is open to the public but the official grand opening celebration is June 26th. It should be quite a fun event with lots of insane skateboarding so be sure to head out there if you're in the area. After the completion of Big Sandy #2 the crew will head up the road to Havre, Montana to build a nice bowl there. Stay tuned.